I'm so excited to be part of Bob's Red Mill and the FeedFeed holiday cookie swap this weekend! These cute wreath cookies feature Bob's organic flour and have a crisp, buttery shortbread base. For those that weren't born with piping skills, don't worry! Instead, try dipping fresh herbs in egg white and roll in sugar to create a frosted leaf look. Dunk the tops of the cookies into lemon glaze and form the leaves into a wreath shape and let set. 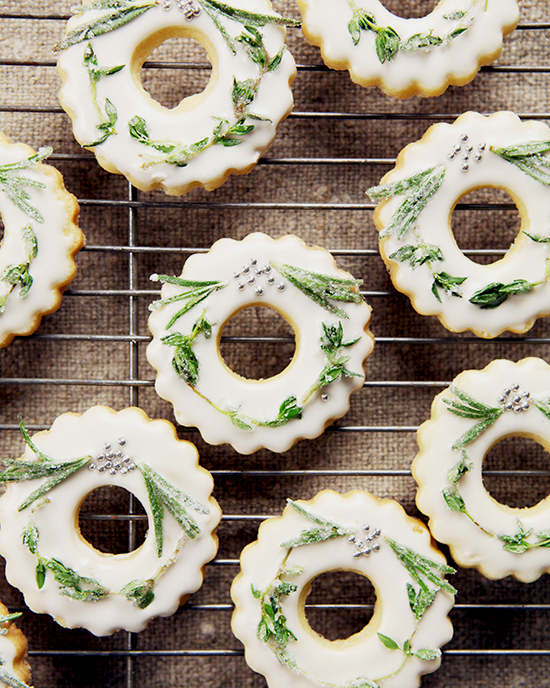 The tangy frosting goes perfectly with the chewy candied thyme and rosemary leaves. You're left with the most adorable wreath cookies with decorations that you actually want to eat! Our friends at Epicurious asked us to come up with a fun new twist on decorating Easter eggs. The inspiration for these eggs come from adult coloring books. Check out the video for our tutorial and here to see the detailed steps. Happy Easter folks!